When you write a story you must be objective, truthful, and fair. Example: The first nearly 900 cubic tons of concrete was poured along a section of Detroit’s M1 Rail on Woodward at John R. in downtown Detroit Saturday. Let the facts tell the story and the readers draw their own conclusions. Base your stories on the best facts you can find. 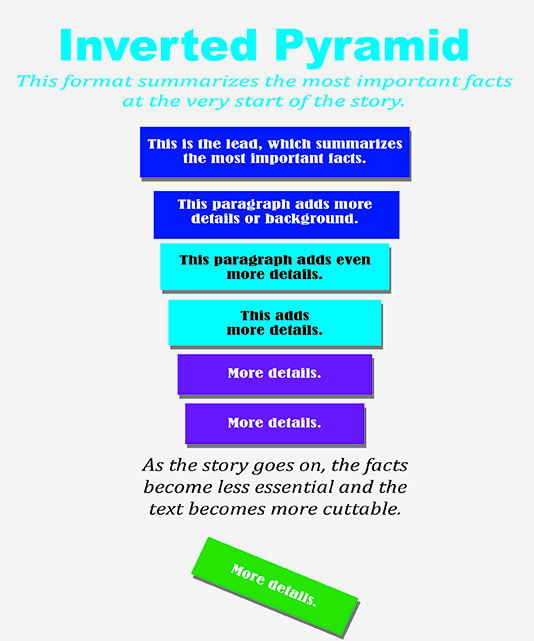 The Inverted Pyramid is not a style that can be used for every type of story. It works best when arranging facts for breaking news quickly and efficiently. Summarize first, Explain later. Summarize what’s newsy. Add additional facts in descending order of importance. Combine with images to keep your story strong and interesting. If you don’t know the whole story your lead can’t accurately summarize what’s going on. Organize your thinking, jot down the five W’s in a list. 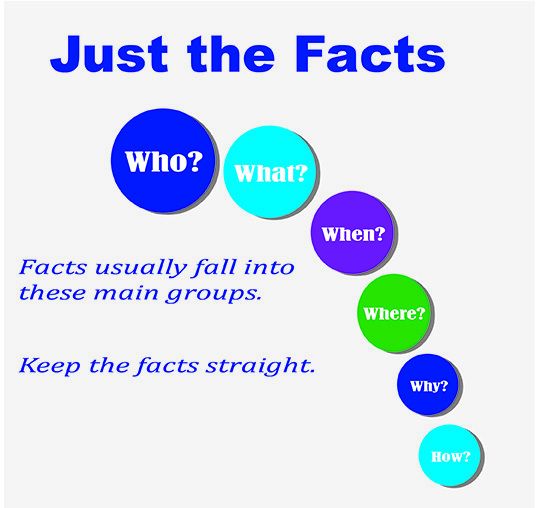 Start with the facts that are most important, and only those facts that are most important. Start your first sentence with the key fact that is most important. Remember, it can be any one of the five W’s. Write a draft, ask yourself, Is it clear, Is it active, Is it compelling, Is it wordy. 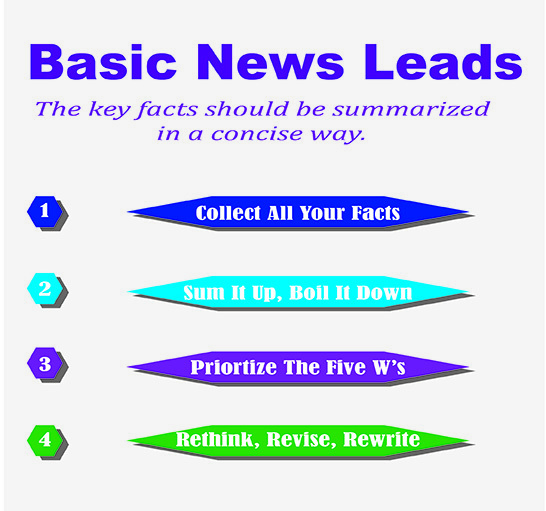 Best for: News Briefs, Breaking News Events Summarize the facts in a concise lead then organize the story as logically as possible in descending order of importance. Best for: News stories where you want to include a chronology to show how events unfolded. 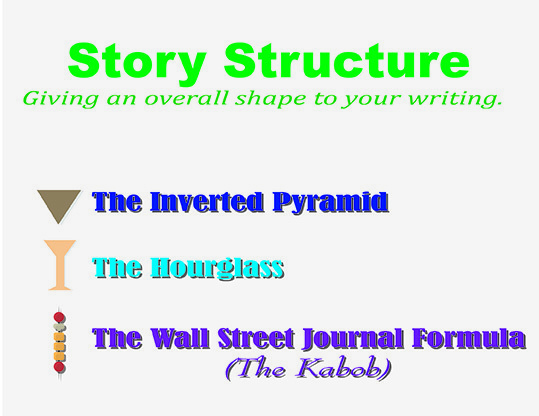 Begin with the inverted pyramid summary of the story’s most important facts then shift to a chronological narrative. Best for: Stories on trends or events where you want to show how actual people are affected or involved. Begin with a quote or anecdote about a specific person. Then broaden into a general discussion of the topic. End by returning to that specific person again. Inverted Pyramid Example: A search is underway for a criminal who leaped from a police van outside of Jackson State Prison. After pleading guilty to second-degree murder in court, Pete Moss was on his way to begin serving a 10-year sentence when he escaped. Moss had been arrested Sept. 21 after confessing to killing Lynn C. Doyle by running him over in an alley with his car. Moss admitted he had been furious with Doyle for shooting Moss’s dog during a marijuana deal. Doyle into an alley and crushed him against a dumpster. Doyle Died. The next day, Moss confessed to police that he had run Doyle over. He was arrested and charged with second-degree murder. Yesterday, Moss pleaded guilty in court. The judge sentenced him to 10 years in prison. On his way to Jackson State Prison, Moss leaped from a police van and escaped. A search is underway. Avoid weak, flabby verbs. Make your sentences emphatic. Clunky phrases like there is should be avoided. Avoid unnecessary words and phrases. Some common examples include, totally destroyed, true facts, end result, very unique, personal opinion and first time ever. Avoid using flabby or inflated wording, piling up clauses, using parenthesis or semicolons to make your story sound more profound or scholarly. Avoid sounding like a bureaucrat, a law enforcement official, or a spokesperson. Filter out bloated, convoluted jargon and officialese. And absolutely try to avoid journalese. Avoid clichés entirely. Tired worn out clichés lower the IQ of your writing.